Birds are a wonderful and necessary part of our life. They can provide enjoyment, have aesthetic appeal and also play an essential part of our ecosystem. Birds can also play an important role as indicators of the health of the overall environment . . . a bit like the canary in the coal mine. However birds can also cause problems both for businesses and individuals. They can cause property damage with their nesting and droppings, be a hazard to passers-by during their nesting season and in the worst case, birds can also spread diseases to man. For these reasons, it’s important to realise that there are times when it may be necessary to implement a bird control strategy for the safety of you, your workers and your family. Perth Pest Control are licensed to undertake a full range of bird control methods and would be happy to provide a solution for your bird control problem. 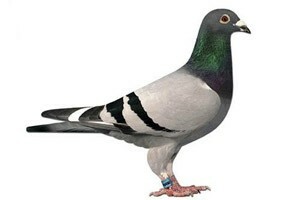 Pigeon – the common pigeon (or Rock Pigeon) is found all over Australia. Some breeds of pigeon are kept by fanciers for racing or show however most of the pigeons seen around Western Australia are feral birds where they exist primarily as scavengers. They, like most birds, happily coexist with humans and in fact our actions quite often attract them. They can be found anywhere from recreational parks to industrial sites and of course inner city locations. Prolific breeders, pigeons will typically lay eggs all year round and their nests can be found on protected, or semi-protected, roof ledges. Seagull – a common sight around waterways, beaches, rivers and the like, seagulls have adapted their ways to become, primarily, a scavenger that survives on pestering humans for food scraps and searching for refuse from rubbish tips. 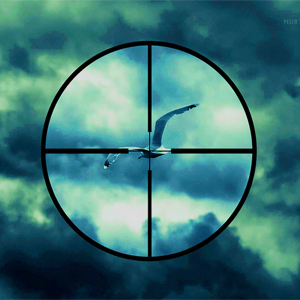 Seagulls tend to nest in offshore islands or in areas of vegetation around water bodies. 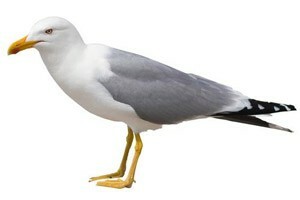 Twice a year seagulls will make a brood of 2 – 4 in a ground based nest consisting mainly of local vegetation. 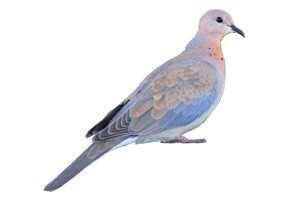 Dove – the common dove that can be seen anywhere in rural or metro areas, is actually an introduced species. Doves eat various grains, seeds, small berries and fruits and occasionally small bugs and worms. Doves are ubiquitous and can often be seen in large flocks that congregate on rooftops, overhead wires, TV antennae and by the side of roads. Doves breed all year round and their nests tend to be located in branches of trees and shrubs. Bird droppings have a very acidic content and accumulation of the droppings on rooftops over a period of time, can cause corrosion on metal rooves and gutters and subsequently water leakage may occur. This may be particularly dangerous, and costly, in a warehouse for example. 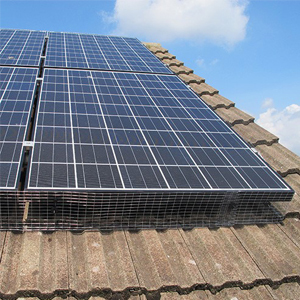 As well, some birds (eg pigeons) can build their nests in nooks and crannies on rooves such as in the gutters and may result in clogged drainage systems and water damage. 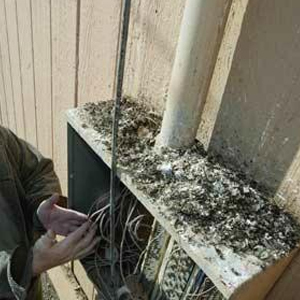 Typically air conditioning units are located on rooftops and the acidic content of bird faeces can cause corrosion and further damage to these units with an associated costly repair bill ensuing. Another example of the corrosive effects of avian faeces is not uncommon in the motor vehicle industry where cars may be stored, or displayed, outside. Droppings on the body of a car have caused damage to the paint finish which also results in expensive repair costs to the vehicle. Birds flying into warehouses, factories and under loading bays can cause numerous problems. Food awaiting loading (eg bread) is commonly destroyed by birds. Birds will typically fly into a warehouse and nest high in the roof depositing faeces on products and pallets below and apart from the physical damage, this can also present health problems for workers. Bird nests, in this situation, can also present a fire risk particularly if located near electrical systems and in fact electrical sign companies attribute a lot of the fires they have in their products to bird presence. 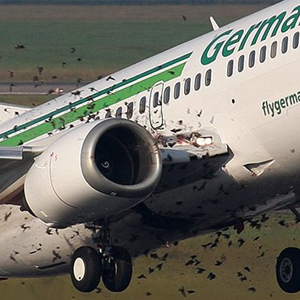 The ingestion of a bird, or birds, into the engine of a plane can, and has, caused catastrophic accidents and for this reason, airport managers are extremely conscious of any bird populations in the vicinity of the airport, and the need to control the numbers of birds in the vicinity of the airport. 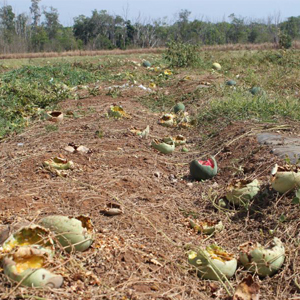 Some bird pests will freely consume crops which, in a commercial venture, can be extremely financially damaging to a business. 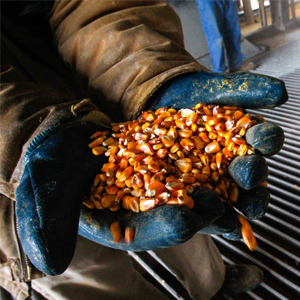 Birds eating grain crops as well as grapes, apples, cherries and similar food crops, are extremely common and a major problem for farmers. Bird droppings on footpaths, door entrances and stairs can be hazardous as pedestrians may slip. Quiet, rarely used areas such as fire escape landings are popular havens for pigeons and doves and it’s not uncommon to see a build of droppings in these spots. Over time this build-up of faeces can be odoriferous and the resultant foul smell will attract unwanted insects and bacteria. There are a number of other diseases transmitted by birds and a keen awareness of the potential risk of this is important. When a bird presence is found inside a factory or warehouse for example, the initial recommendation by us would be to make sure your premises are properly proofed. Bird will enter through any open areas that may be under eaves or through doors and windows and blocking any such entry points is crucial in isolating the bird problem. Purpose built netting can be installed to exclude birds from entering your premises. 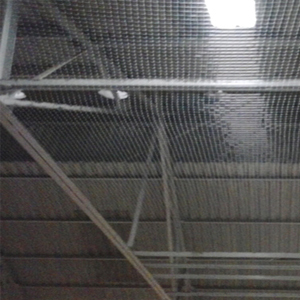 Large open loading bays, warehouses and sporting stadiums for example may provide many opportunities for bird entry and netting specifically designed for that location to stop a particular bird may be essential. The netting is made from a UV stabilised material and is a good long term solution. This method is used to stop birds landing on a ledge, top of a building etc. They are essentially stainless steel spikes supported in a plastic base. The spikes are positioned at a range of angles making it impossible for birds to land on that spot. Spiking also, is a good long term solution for bird control. It is now used in places like airports, CBD buildings and large sign installations that require an effective long term, low maintenance bird control solution. 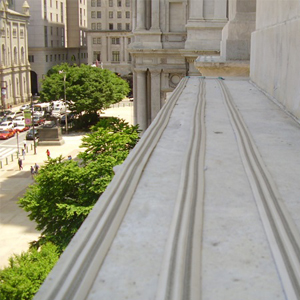 Similar in function to the bird spiking system in that it effectively prevents birds landing on a particular location such as the ledge of a building. The system incorporates stainless steel posts with sprung loaded stainless steel wires between them. The ‘springy’ effect of the wires makes it extremely uncomfortable for a bird to land. 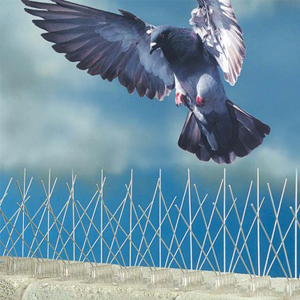 This method of bird control is perhaps more aesthetically pleasing than the spiking system and suits building ledges that may be at a low level or require a method that is visually less obtrusive than the spiked system. 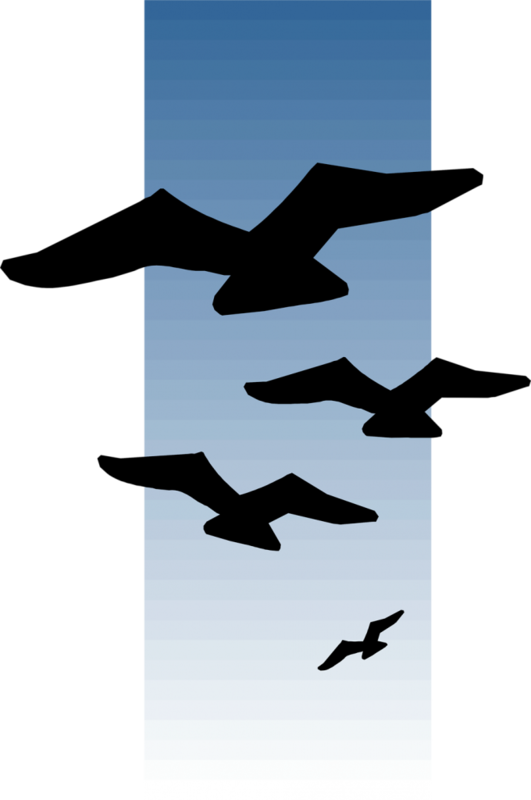 A method of bird control that incorporates a metal strip or track that is attached onto a ledge of a building for example. Works along the lines of the bird spikes and post and wire system in that it makes for a very uncomfortable landing zone for a bird. 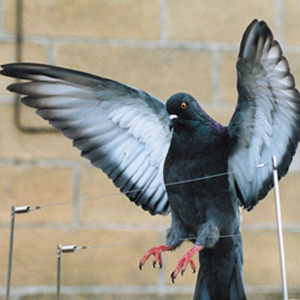 A low level electric current is passed through the wires to deter a bird from landing and although this method can be effective, it requires more maintenance than the other deterrents. A more aggressive approach is sometimes needed for bird control particularly where there is a congregation of a large number of birds such as in a vineyard or grain storage area. An avian attractive bait is used laced with a strong narcotic additive that will render a bird unconscious for removal and is an effective bird control method. Perth Pest control is fully licensed to perform all the methods of bird pest control detailed above. We are a professional company that guarantees all our work with industry leading warranties. If you would like further suggestions on how to eliminate the bird problem on your premises, or for a free onsite assessment and recommendation, please contact us for more information. The window ledges on our 3rd storey office seem to be a haven for pigeons and doves, can we stop them landing there? Birds congregating on a commercial window ledge is not uncommon . . . particularly in older buildings. The major issue with that is the collection of faeces can make the building an eyesore. Yes, we can eliminate this problem using one of a variety of methods such as spikes or visual deterrents. Our warehouse constantly has birds entering through the loading dock. They leave droppings around the warehouse and we’ve even found nests in the roof. It’s not practical to close the loading bay so how can we stop the birds entering? Bird proofing is a proven way to block their entry into large scale industrial premises. Netting can be configured so it blocks their entry point but doesn’t impede workers. As well, other entry points can be proofed permanently using mesh barriers. Contact Perth Pest Control for more details. 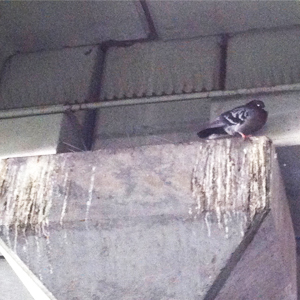 I have a major issue with pigeons in a large warehouse renovation my company is undertaking. They invade constantly, leaving droppings everywhere. How can you stop them? The hazard presented by a bird invasion in this situation can be a serious health issue for workers and so the threat needs to be controlled quickly and effectively. Fumes from dried faeces may cause respiratory issues, and even a build-up of bird droppings on a structure may can cause damage to the building itself. This problem is one where we may have to employ more aggressive methods than spikes or netting and involves baiting and possibly shooting. Perth Pest Control has a good degree of expertise with bird control so contact us for more details.